Jennifer Menzies, editor of The Flow, reminds readers that participating in the creative process with other artists leads to producing designs that could not happen singularly. 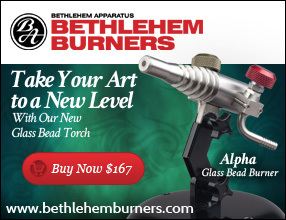 The lampworking community has proven that by working together artists also thrive, since collaboration also increases exposure to new collectors and retail opportunities. St. Elmo’s Fire is one of the largest privately owned flameworking studios in Northern America and home to the Baller Section Agency plus ten resident artists. The studio shares this gallery, which includes the collaborative work of sixteen artists who are have established a relationship with St. Elmo’s. 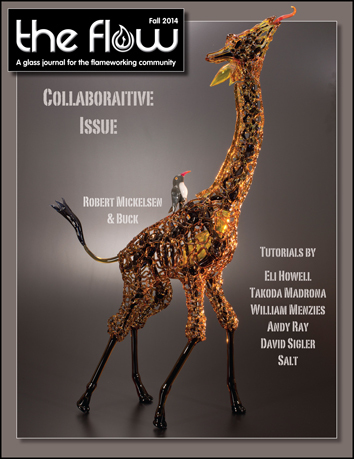 Glass artist Robert Mickelsen shares how creating collaboratively with functional glass artists led to the rebirth of his artistic career. Projects completed with Salt, Darby Holm, Buck, Banjo, and others cover a wide gamut of subjects and have taught him to appreciate the give and take required in collaborative work. Bead artist, Lisa Mosser, has worked with wood artist husband Chuck Mosser to create bead-enhanced, turtle shaped wood boxes, a commissioned trophy award piece, and other unique pieces. Their favorite collaborations are the wood goblets they have recently begun to make using flameworked beads for the goblet stems. After working in many art mediums, Leslie Speicher focused her creativity on classic and funky flameworked beads, including her signature puffy beads. In 2012, she opened the Chicago Glass Collective, a community-based art studio with dedicated studio space where new and experienced glass artists can exchange ideas. Mother and son artists, Deb Crowley and Pat Laundrie, enjoy working together to create unique perfume bottles. Pat fashions the bottles, then Deb creates the stoppers. After collaborating on more than forty bottles, the pair are grateful to have this opportunity to share their work in glass as a family. Robert Gutierrez was initially inspired to create a super-large cave model from borosilicate after witnessing firsthand the incredible load-carrying capacity of a geodesic dome. Lechuguilla is filled with over 500 dark amethyst stalactites totaling nearly 3,000 pounds of glass housed inside a steel 12-foot wide by 20-foot tall geodesic dome. Tim Tate of the Washington Glass School and author/art critic William Warmus selected Facebook as the venue for artists to explore how well the medium of glass is integrated into the art world. 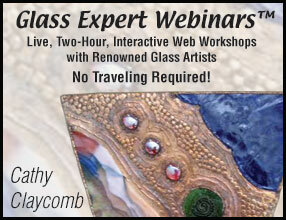 Known as Glass Secessionism (GS), the group’s goal is simply to talk about excellence in glass art. Andy Ray reminds us that mapping out a strategy ahead of time is fundamental to successful collaborative work. Sketching out the work, determining the scale and color of the piece, and determining acknowledgments are some of the most important decisions that help make creating collaboratively much more enjoyable. Marc Kornbluh introduces High Volume Oxygen (HVO) Systems, a less expensive alternative to bottled and liquid oxygen. HVO designed the system with the help of NCEE Laboratories and obtained a CE certification, demonstrating that the company conforms to the highest standards for engineering and product safety. Takoda Madrona demonstrates making a tarantula body from clear tubing rolled in frit and formed into the bulbous shape of the tarantula’s body. The legs are fashioned from 8 mm rod, attached to the body, then shaped with the use of various tools including pliers and a graphite paddle. Andy Ray, Eli Howell, and David Sigler demonstrate the process for combining two marble halves into one double-lensed marble. The halves are welded together, and the valley section where they meet is filled with clear glass. Double rows of dots form dragon scales to finish the decoration for the marble. William Menzies demonstrates creating a traditional jewelry bail with the use of a tungsten pick. The tutorial then focuses on using permanent double bridges to produce unique and complex jewelry pieces. A horn shape is added to provide balance to the finished pendant. Arnold Howard, who writes instruction manuals for Paragon Industries, L.P., discusses the importance of using posts to elevate kiln shelves for more even heat and using a shelf under molds to protect the bottom of the kiln from melted glass. Salt demonstrates his Sculpturally Applied Linear Tunnel technique using a hot-dog-and-bun-shaped sculpture. The color for the hot dog is created by blending Lobster and Cotton Candy Borosticks that are blended into one rod. Realistic colors and shading are added to the bun and condiments using glass powders, rods, and frits.